Split MP3 1.0 - Download Win Apps. Easily cut MP3 and save final output in various formats..
SM is a simple little program that can split any of your MP3 files easily. 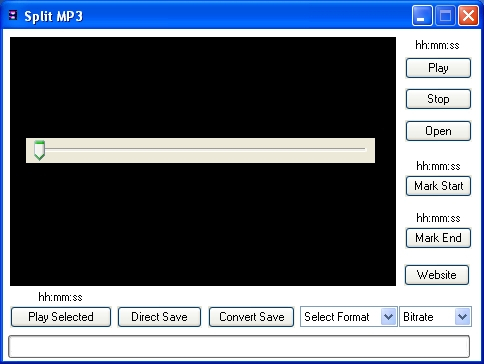 You can directly save the output to an MP3 file without converting it and hence finishing the job quickly. You can also save the final output in MP3, WAV, AAC, WMA, FLAC, M4A or AC3 format. You can also set the final bitrate and hence deciding the final size and quality. This software offers a solution to users who want to split one or more MP3 files into smaller files. Based on a time increment you provide, new files of that length are created. The final segmented file will be the remainder of the division. In comparison to Split MP3 is an extremely easy and fast-speed tool to digitally convert your audio CD to MP3, WAV, WMA, RM and OGG files. It copies the audio digitally-not through the soundcard-which enables you to make perfect copies of the originals. A complete software package to convert mp3 to wav,wav to mp3. cut mp3 segments, combine multi mp3 files into one or play, rip Music CDs to mp3 or wave. it also comes with an ID3 tag editor and a built in player.